Last week I wrote a blog on Twitter Analytics. In this post I am going to talk about a ReTweet, a Twitter action and a KPI that I mentioned in my previous blog posts on Twitter. ReTweet is when someone takes your tweet (a post on twitter) and tweets it again so that his/her followers can read it too. ReTweet is where the true power of a network like Twitter emerges. For example if you have a network of 1000 followers then you are only reaching 1000 people. But if those 1000 (or subset of them) people take your message and ReTweet it so that it is broadcasted to their followers that’s when the message begins to extend beyond its original reach. If the message is compelling then it will be ReTweeted by your followers and their followers and their followers and it will go on. You like a tweet and decide to send it your followers. You generally do it using RT, R/T, ReTweet followed by a blank space, the symbol @ and the username of the person who tweeted it and then the tweet. Keeping up with spirit of Twitter, RT has the least amount of characters and is the best way (in my opinion) and the most common way to retweet. (I know this is more than 140 characters but that’s the not the point). Since the real power of ReTweet is that it propogates the message byond direct followers so what is the right format of ReTweet when you get a message from JohnDoe that was a retweet of a message of JaneDoe? Should you ReTweet it as a message from JohnDoe or JaneDoe or both? The correct way to RT, in my opinion, is to always credit the original tweeter and if you still have room left to add more characters in your tweet then credit the person who sent you the tweet. JohnSong takes this message and RTs: RT@anilbatra Working on a post on ReTweeting to continue my series of twitter posts, http://cli.gs/6tgAUT. Anything that you would like me to cover? Aaronlovlace tweets: RT@anilbatra RT @johnsong Working on a post on ReTweeting to continue my series of twitter posts, http://cli.gs/6tgAUT. Anything that you would like me to cover? The main thing to keep in mind is to credit the original Tweeter first and then the person who passed the tweet to you. According to a tweet from @agray, you should not add the hashtag (#) again if you are not adding any new insight in the RT. (see the example above, where a hashtag was removed from both twitter and wa). RT also help you in gaining new friends and followers. ReTweeting helps you propagate a message to your followers that is relevant to them but might have missed since they don’t follower the original tweeter. They might rely on you as an expert in certain area and it becomes your obligation to your followers to keep them updated on the tweets in your area of expertise. If you take someone’s message and RT then you are sending a message to that person that you are an ethical ReTweeters and genuinely following that person (and BTW: pay attention to my tweets and return the favor by ReTweeting my messages). As I wrote in my previous blog post, ReTweet is one of the KPIs you should use to measure your Success on Twitter. ReTweets is a measure of how good your tweets are. If you send a message and nobody ReTweets then possibility is that the message was not compelling enough for people to ReTweet or you have followers who really are not paying attention to your tweets. As I said before the ReTweet propagates your message beyond your direct followers. This allows you to reach people who might not have otherwise followed you. For ReTweets to work we all need to follow the ReTweeting best practices I outlined in this post. There is a lot of discussion recently about how to measure authority, influence etc. on Twitter. There are a lot of tools popping up which claim to give some kind of score to help you measure you (or anyone else) against everybody else. This post is not about those tools and which ones I like (more on that later). This post is about things that we can track for sure. There are millions of Twitter users who are tweeting every day, hoping and assuming that there tweets are being read by their followers. We can’t track all tweets and find out if they are being read but if you are one of those who post a link in your tweets then you are in luck. This post will show you how to track URLs posted in your tweets so that you can determine for sure if anybody is reading those tweets and also what kind of tweets from you are getting the most attention. URLs to you site – When you post a link to your site on twitter, you can treat it as a campaign just like a banner or search campaign. Add the campaign tracking codes compliant with your web analytics tool so that you can see the visits, page views, conversions and other web analytics data when a visitors clicks on your tweeted link and arrives on your site. I use Google Analytics (GA) and you wanted to post a link to http://AnilBatra.com/, instead of just posting http://AnilBatra.com/ in my tweets, I add GA campaign parameters to the URL being posted. utm_campaign, utm_medium and utm_source are three query parameters that GA uses for campaign tracking. Adding WebTrends Paramater: http://AnilBatra.com/?wt.mc_id=011909tweet. Where WT.mc_id is the Webtrends campaign tracking paramter. You can use which ever web analytics tool you like, the key is adding the campaign tracking parameters the URL to be tweeted. It is that simple. URLs to third party sites– Quite often tweeters post links to sites for which they don’t have access to the web analytics reports. For example, you posting a link to my blog http://webanalysis.blogspot.com/, you don’t have access to my Web Analytics Reports. As a results you have no idea how many people click though to the link that you tweeted. Social media monitoring Cligs keeps track in real time of who tweets your link, who shares it on Friendfeed, who links to it, who blogs about it, who writes a blog comment about it, and more. Not just that, Cligs does that for the destination URL too! For the sites that I have access to the web analytics data, I create a tracking url as I showed above (1) and then use CLIGS to shorten the URL (2), this provides me both CLIGS and Web Analytics data for analysis. Apart from tracking on links the other ways to determine if your tweets are getting attention is to see the number of Retweets you get, direct messages and @replies you get. I will cover those in my future blog post. Visitors go to search engines because they are looking for something. They enter their search query and want the search engine to provide relevant results. Marketers buy Paid Search listings because they want to cash in on visitors searches by providing relevant product/services/offers etc. Remember, users are looking for results and not another set of search boxes or additional navigation to get to what they want. It is marketers’ responsibility to make sure the offers shown on their landing pages are relevant to the search keyword that the user searched for. DON’T make the visitors search again. Provide the user with relevant results right away. Don’t make people click more buttons or links to find what they are looking for. Which one do you think will be most successful in getting visitor to book a hotel? See the screen shots below and you will know. Orbitz takes me to a generic hotel search page and wants me to search again. 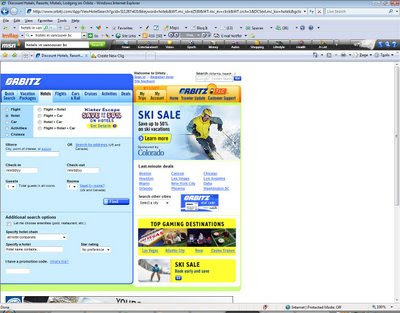 It has “Ski Sale” listed in in-house banners on two prominent places. Where is ANYTHING related to Vancouver BC??? The site wants me to search again and does not provide offers or banners that are speaking to me. This site is pushing what it wants to sell and not what I want to buy. I don’t like it. I click back. 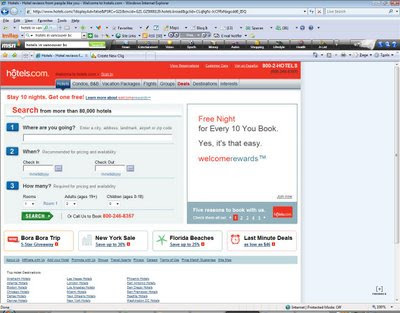 Hotels.com takes me to a generic hotel search page, just like Orbitz did. 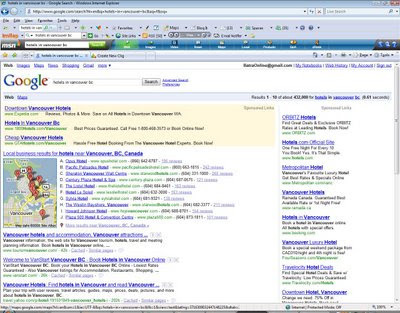 It shows Bora Bora, New York but Vancouver is nowhere to be found. What, you want me to search again??? Sorry, but I don’t have time. Check your bounce rate, you will see me there. 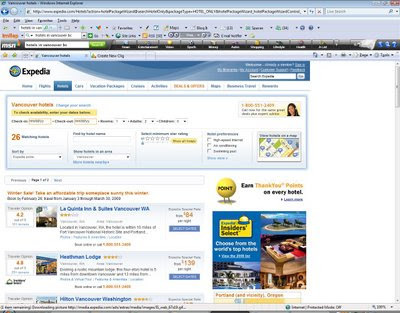 Expedia shows me the Vancouver hotels right on the landing page, provides me ratings, rates etc. It makes it easy for me to book my hotel. Rather than making me search again, it is getting right to the business of selling. Which one do you think will drive more conversions? Lesson: When it comes to buying paid search traffic, don’t make your potential customers search again or browse around your site to find what they need because they won’t. Give them a relevant landing page and get to the business of closing the deal. One thing you might be worried about is how you will go about generating all of these relevant landing pages. There are several tools such as Optimost, Test&Target, Widemile etc. that will take care of this for you. Most of the time you might just setup a generic landing page template and fill-in the content on the fly based on the referring keyword (see Follow the Search blog post that I wrote). The increase in conversion will itself pay for the cost of setting up unique landing pages, so cost should not be an issue. If you still can’t justify the cost of having a unique and relevant landing pages then keep in mind that if you bid without relevant landing pages, two things will happen; First, as we already discussed, your visitors will bounce off of your site and go elsewhere. Second, the ad network (Google AdWords, especially) will penalize your page by decreasing your quality score, thus making it increasingly expensive over time to buy clicks. Yes, Google does score your landing page and will increase your minimum keyword bid prices if it doesn’t think you are providing its users with what they are looking for. Long story short: make your landing pages relevant. Having relevant landing page will result in increase in revenue, lower bid cost and increase in profit.